1971 CHEVROLET CORVETTE ROADSTER. This car is an original big block air conditioned convertible, currently its equipped with a 427 (68 vette IL block) with 66 high performance heads and 11 - 1 compression, "dyno-ed" at 477HP coupled with an M22 transmission which if I'm not mistaken only 130 71 vettes were equipped as such. In other words this car is rare, fast, and can be dangerous, therefore I will not sale it to anyone less than 25 years of age. 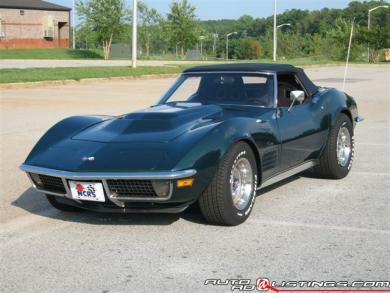 Obviously this is not a matching numbers car as 71 vettes were equipped with 454s. I've owned the car for 7 years and have put just over 4000 miles on it, beyond that it's been garaged and covered the entire time. As powerful as the car is I've never had a mechanical issue with the car nor does it run hot even on the hottest days of July in Atlanta's stop and go traffic. The previous owner stripped the car to the glass and had it repainted the original brandshatch green. The paint is great driver quality as it's very glossy but it's not show quality. It's showing signs of slight wear, small rock chips and hairline cracks, not visible at distances greater than 1 foot but none-the-less they are present and I'm just being honest. The interior is in good to great condition I just replaced the carpet last week, the seats are fine - no tears or rips, the dash is fine but the center console is fairly worn and has a number of scratches, door panels are fine as they have been replaced as well. The chrome is in great shape, both exterior mirrors were just replaced as well as the shocks and tires. The brakes need some attention as they are a little soft, calipers probably need to be rebuilt or replaced (since they are so cheap) and the rubber brake hoses replaced, the brake system doesn't leak - it's just a little soft. The A/C compressor and all brackets (if you've ever priced the brackets you'll know why I mention them) are included with the car but not installed, along with the condensor, hoses fittings etc... Included are many misc parts and pieces, honestly to much to mention and not a lot of tremendous value in these parts. Also available but not included in the price is a painted hardtop, available if interested at an additional cost - negotiable. Long story short it's a great car that just needs a little TLC at this point - nothing major. However I've purchased an 05 Viper that I've fallen in love with, I'm moving to Florida and do not have room for all the toys at the new house therefore the vette has to go. If interested contact Dennie at 404 247 8623, and I'll give you honest answers in an effort to save everyone time and disappointment, thanks for looking.